You’ll feel like family when you shop at Frank’s Shop Rite. When you come in and shop our clean store you’ll be greeted by friendly smiles and helpful associates ready to assist you. Browse well stocked shelves and enjoy top quality products like fresh Tender Ridge Angus in our Meat department, as well as custom products like Frank’s own hamburger patties, and the Our Family® brand, one of the oldest and most established brands in the country, backed by a 200% Freshness Guarantee. From our deli and bakery experts ready to assist with your next event to our friendly, smiling cashiers and baggers at checkout you'll find the value, quality and experience you're looking for along with the convenience of getting in and out as quickly as you’d like. And when you come in, don't be surprised if our friendly staff greets you by name! 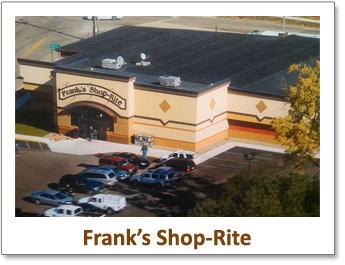 We're ready every day to serve you and make your shopping experience at Frank's the best you've ever had, because that's how family should be treated.